Tendai (天台宗, Tendai-shū) is a Mahayana Buddhist school established in Japan in the year 806 by a monk named Saicho also known as Dengyō Daishi (伝教大師, posthumous title). The Tendai school rose to prominence during the Heian Period of Japan, gradually eclipsing the powerful Hosso school and competing with the upcoming Shingon school to become the most influential at the Imperial court. However, political entanglements during the Genpei War led many disaffected monks to leave and in some cases to establish their own schools of Buddhism such as Jodo Shu, Nichiren Shu and Soto Zen. Destruction of the head temple Mount Hiei by warlord Oda Nobunaga further weakened Tendai's influence as well as the geographic shift of Japan's capital to Edo away from Kyoto. Tendai Buddhism is a descendant of the parent Chinese Tiantai school, but also introduces some novelties such as the exclusive use of the Bodhisattva Precepts for ordination, its emphasis on the "Four Integrated Schools" and Saicho's emphasis on the "One Vehicle" teaching. In keeping with its parent Tiantai school, the Tendai school holds the Lotus Sutra as the ultimate teaching of the Buddha, and the teachings and practices of Chinese founder Zhiyi remain an important foundation today. Although Tendai (Chin., T'ien-t'ai) has the reputation of being a major denomination in Japanese history, and the most comprehensive and diversified school of Chinese Buddhism, it is almost unknown in the West. This meagre presence is in marked contrast to the vision of the founder of the movement in China, T'ien-t'ai Chih-i (538–597), who provided a religious framework which seemed suited to adapt to other cultures, to evolve new practices, and to universalize Buddhism. Although Tiantai teachings had been brought to Japan as early as 754 with the arrival of Jianzhen (Jp. Ganjin) from China, its teachings did not take root until generations later when a monk named Saicho journeyed to China aboard the Japanese missions to Imperial China in 804. On the same 804 mission to China the future founder of Shingon Buddhism, Kukai, also travelled, however both monks were on separate ships, and never saw one another once they arrived in China. From the city of Ningbo (then called Ming-zhou 明州), Saicho was introduced by the governor to Daosui (道邃) who was the seventh patriarch of the Tiantai school and later when he journeyed to Mount Tiantai for further study. After receiving initiations in Chan Buddhism and esoteric Buddhist traditions on Mount Tiantai, Saicho devoted much of his time to making accurate copies of Tiantai texts, and studying under Daosui. By the sixth month of 805, Saicho had returned to Japan along with the official mission to China. Because of the Imperial Court's interest in Tiantai teachings at the time, as well as esoteric Buddhism, Saicho quickly rose in prominence upon his return. He was asked by Emperor Kanmu to perform various esoteric rituals, and at the same token, Saicho sought recognition from the Emperor of a new, independent school of Tiantai in Japan. Because the emperor sought to reduce the power of the Hosso school, the emperor granted this request, but with the stipulation that the new "Tendai" school would have two programs: one for esoteric Buddhism and one for meditation. However, Emperor Kanmu died shortly thereafter, and Saicho was not allocated any ordinands until 809 with the reign of Emperor Saga. Saicho's choice of establishing his community at Mount Hiei also proved fortuitous because it was located to the northeast of the new capitol of Kyoto and thus was considered auspicious in terms of Chinese geomancy for protecting the capitol. The remainder of Saicho's life was spent in heated debates with notable figures of the Hosso school, particularly Tokuitsu and maintaining an increasingly strained relationship with Kukai to broaden his understanding of esoteric Buddhism. Finally, Saicho's efforts were also devoted to developing a "Mahayana-only" ordination platform that required the Bodhisattva Precepts only, and not through the "Vinaya in Four Parts" that was traditionally used in East Asian Buddhist monasticism. By the time that Saicho died in 822, his yearly petition was finally granted. Seven days after Saicho died, the Imperial Court granted permission for the Tendai sect to exclusively use the Bodhisattva Precepts for its ordination process. This effectively allowed Tendai to use an ordination platform separate from the powerful Buddhist schools in Nara. Gishin, Saicho's disciple and the first zasu (座主, "Head of the Tendai Order"), presided over the first allotted ordinands in 827. Further, the Tendai order underwent efforts to deepen its understanding of teachings that Saicho had brought back, particularly esoteric Buddhism. Saicho had only received initiation in the Diamond Realm Mandala, and since the rival Shingon school under Kukai had received deeper training, early Tendai monks felt it necessary to return to China for further initiation and instruction. Saicho's disciple Ennin went to China in the year 838 and returned ten years later with a more thorough understanding of esoteric Buddhism, but also Pure Land Buddhism teachings, and deeper knowledge of the parent Tiantai school as well. By 864, Tendai monks were now appointed to the powerful sōgō (僧綱, "Office of Monastic Affairs") with the naming of Anné as the provisional vinaya master. Other examples include Enchin's appointment to the Office of Monastic Affairs in 883. While Saicho had opposed the Office during his lifetime, within a few generations disciples were now gifted with positions in the Office by the Imperial Family. By this time, Japanese Buddhism was dominated by the Tendai school to a much greater degree than Chinese Buddhism was by its forebearer, the Tiantai. Appointments as zasu typically only lasted a few years, thus among the same generation of disciples, a number could be appointed zasu in one's lifetime. Philosophically, the Tendai school did not deviate substantially from the beliefs that had been created by the Tiantai school in China. However, what Saichō transmitted from China was not exclusively Tiantai, but also included Zen (禪), the esoteric Mikkyō (密教), and Vinaya School (戒律) elements. The tendency to include a range of teachings became more marked in the doctrines of Saichō's successors, such as Ennin (圓仁) and Enchin (圓珍). However, in later years, this range of teachings began to form sub-schools within Tendai Buddhism. By the time of Ryōgen, there were two distinct groups on Mt. Hiei, the Jimon and Sanmon: the Sammon-ha "Mountain Group" (山門派) followed Ennin and the Jimon-ha "Temple Group" (寺門派) followed Enchin. Although the Tendai sect flourished under the patronage of the Imperial House of Japan and the noble classes, by the end of the Heian Period it experienced an increasing breakdown in monastic discipline, plus political entanglements with rival factions of the Genpei War, namely the Taira and Minamoto clans. Due to its patronage and growing popularity among the upper classes, the Tendai sect became not only respected, but also politically and even militarily powerful, with major temples each fielding their own sōhei monastic armies. This was not unusual for major temples at the time, as rival schools also fielded armies, such as the head temple of the Hosso school, Kofukuji. However, with the outbreak of the Genpei War, Tendai temples even fought one another, such as Hieizan clashing with Miidera, depending on their political affiliations. A number of low-ranking monks of the Tendai Order became dissatisfied and sought to establish independent schools of their own. Such founders as Nichiren, Hōnen, Shinran, Eisai and Dōgen—all famous thinkers in non-Tendai schools of Japanese Buddhism—were all initially trained as Tendai monks. Tendai practices and monastic organization were adopted to some degree or another by each of these new schools, but one common feature of each school was a more narrowly focused set of Buddhist practices (e.g. Zen meditation for Zen, Nembutsu for Pure Land schools, etc) in contrast to the more integrated approach of the Tendai. Although a number of breakaway schools rose during the Kamakura period, the Tendai school used its patronage to try to oppose the growth of these rival factions—particularly Nichiren Buddhism, which began to grow in power among the merchant middle class, and Pure Land Buddhism, which eventually came to claim the loyalty of many of the poorer classes. Enryaku-ji, the temple complex on Mount Hiei, became a sprawling center of power, attended not only by ascetic monks, but also by brigades of sōhei or warrior-monks who fought in the temple's interest. As a result, in 1571 Enryaku-ji was razed by Oda Nobunaga as part of his campaign to unify Japan. 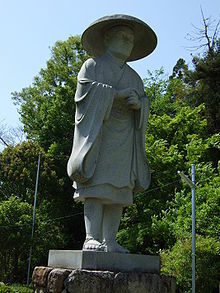 Nobunaga regarded the Mount Hiei monks as a potential threat or rival, as they could employ religious claims to attempt to rally the populace to their side. The temple complex was later rebuilt, and continues to serve as the head Tendai temple today. The first characteristic of the Japanese Tendai school is its advocacy of a comprehensive Buddhism, ... the idea that all the teachings of the Buddha are ultimately without contradiction and can be unified in one comprehensive and perfect system. Chih-i, founder of T'ien-t'ai philosophy and practice, attempted this synthesis on the basis of the ekayāna doctrine of the Lotus Sutra. All Buddhist teachings and practices fit into a single "vehicle". Saicho frequently used the term ichijō bukkyō (一乗仏教, "One Vehicle Buddhism") and referred to the second chapter of the Lotus Sutra for his scriptural basis. All beings have the potential for full buddhahood. This teaching in particular was a major point of contention with the powerful Hosso school in Japan who espoused the Five Natures Doctrine (五姓各別, goshō kakubetsu). The heated debates between Saicho and Tokuitsu of the Hosso school frequently centered around this topic, and mirrored similar debates between the parent schools in China. The importance of expedient means or hōben (方便). Tendai Buddhism uses a similar hierarchy as the parent Tiantai sect in to classify the various other sutra in the Buddhism canon in relation to the Lotus Sutra, and it also follows Zhiyi's original conception of Five Periods Eight Teachings or gojihakkyō (五時八教) in Japanese. This is based on the doctrine of expedient means, but was also a common practice among East Asian schools trying to sort the vast corpus of writing inherited from Indian Buddhism. Pure Land practices - veneration of Amitabha Buddha, recitation of the Buddha's name nembutsu, etc. Dhyana meditation - which comprises both samatha and vipassanā meditation. In Japanese Tendai, this is called shikan (止観, "Calming-Insight") meditation. Much of this comes from the writings of Zhiyi and the parent Tiantai school. Esoteric practices - also known as taimitsu (台密). Precepts - in particular the Bodhisattva Precepts. In addition, sutras from each of these schools are revered, chanted and studied in Tendai Buddhism. In the early decades of the twentieth century, Buddhologist Shimaji Daito (1875–1927) introduced to the Japanese academic world a new interpretive category, which he called "original enlightenment thought" (Jpn. hongaku shiso). By this term he meant, in general, those strands of Buddhist thought, most prominent in East Asia and especially in Japan, that regard enlightenment or the ideal state as inherent from the outset and as accessible in the present, rather than as the fruit of a long process of cultivation. More specifically, Shimaji used "original enlightenment thought" to designate the intellectual mainstream of medieval Japanese Tendai Buddhism. In this medieval Tendai context, "original enlightenment thought" denotes an array of doctrines and concepts associated with the proposition that all beings are enlightened inherently. Not only human beings, but ants and crickets, mountains and rivers, grasses and trees are all innately Buddhas. The Buddhas who appear in sutras, radiating light and endowed with excellent marks, are merely provisional signs. The "real" Buddha is the ordinary worldling. Indeed, the whole phenomenal world is the primordially enlightened Tathāgata. However, both meditation on the Pure Land (kansõ nenbutsu 観想念仏) and recitation of the Buddha's name (shōmyō nenbutsu 称名念仏) became an integral part of Pure Land practices in the Tendai tradition. In addition to the five-tone nenbutsu brought back from China, Ennin also integrated a special monastic training program called the jōgyō zanmai (常行三昧, "Constantly Walking samadhi") originally promulgated by Chinese Tiantai master Zhiyi. In this practice, monks spend 90 days in retreat, circumambulating a statue of Amitabha Buddha constantly reciting his name. In addition to increasing monastic practices related to the Pure Land, Tendai monks also taught Pure Land practices to the lay community in the form of reciting the Buddha's name. The most famous of these nenbutsu hijiri (念仏聖, "Itinerant Pure Land teachers") was a monk named Kūya (空也, 903-972). Pure Land Buddhist thought was further developed by a Tendai monk named Genshin (源信, 942-1017) who was a disciple of Ryōgen, the 18th chief abbot or zasu (座主) of Mount Hiei. Genshin wrote a influential treatise called The Essentials of Rebirth in the Pure Land (往生要集, Ōjōyōshū) which vividly contrasted the Pure Land of Amitabha Buddha with the descriptions of the hell realms in Buddhism. Further, Genshin promoted the popular notion of the Latter Age of the Dharma which posited that society had degenerated to a point when they could no longer rely on traditional Buddhist practices, and would instead need to rely solely on Amitabha Buddha's grace to escape the cycle of birth and death. Genshin drew upon past Chinese Pure Land teachers such as Daochuo and Shandao. Finally, Pure Land practices in Tendai were further popularized by former Tendai monk Honen who established the first independent Pure Land school and whose disciples carried the teachings to remote provinces in one form or another. This includes another ex-Tendai monk named Shinran who eventually established the related Jodo Shinshu school. One of the adaptations by the Tendai school was the introduction of esoteric ritual into Tendai Buddhism, which was later named Taimitsu (台密) which distinguishes it from the Shingon Buddhist esoteric lineage also known as Tōmitsu (東密). Eventually, according to Tendai Taimitsu doctrine, the esoteric rituals came to be considered of equal importance with the exoteric teachings of the Lotus Sutra. Therefore, by chanting mantras, maintaining mudras, or performing certain meditations, one is able to see that the sense experiences are the teachings of Buddha, have faith that one is inherently an enlightened being, and one can attain enlightenment within this very body. The origins of Taimitsu are found in Chinese Tangmi, similar to the lineage that Kūkai encountered in his visit to China during the Tang dynasty, and Saichō's disciples were encouraged to study under Kūkai. As a result, Tendai esoteric ritual bears much in common with the explicitly Vajrayana tradition of Shingon Buddhism, though the underlying doctrines may differ somewhat. Where Shingon Buddhism sees esoteric teachings as the highest teachings in Buddhism, Tendai Buddhism sees esoteric teachings as a means to an end in order to understand the profundity of the Lotus Sutra. Another difference is the sutras and mandalas used. Where Shingon Buddhism emphasizes the Mandala of the Two Realms, and by extension the Mahavairocana Tantra and the Vajrasekhara Sutra, for its esoteric practices, the Tendai lineage of esoteric Buddhism adds a third sutra called the Susiddhikāra Sūtra or soshitsu jikyō (蘇悉地経) and its related tantric practices. Other differences mainly relate to lineages and outlook. The existing lineage began with the founder, Saicho, however his training had largely been limited to the Diamond Realm Mandala only. After Saicho died, his disciple Ennin journeyed to China on the last diplomatic mission to China and after extensive training returned with both esoteric practices and Pure Land practices. Ryōgen is known generally by the names of Gansan Daishi (left) or Tsuno Daishi ("Horned Great Master", right). Tsuno Daishi is said to be a portrait of him subjugating yūrei. Gishin – Second zasu (座主, "Head priest") of the Tendai School, who travelled with Saicho to China and ordained alongside him. Ennin – Saicho's successor, the first to try to merge esoteric practices with exoteric Tendai School theories (this merger is now known as "Taimitsu"), as well as promote nianfo. Enchin – Gishin successor, junior to Ennin. The first to successfully assimilate esoteric buddhism to Tendai, and a notable administrator as well. Annen - Henjō (Ennin's disciple)'s successor, junior to Enchin. An influential thinker who's known having finalized the assimilation of esoteric and exoteric buddhism within Tendai. Ryōgen – Annen's successor, and skilled politician who helped ally the Tendai School with the Fujiwara clan. Toba Sōjō (1053–1140) – the 48th zasu and a satirical artist. Sometimes he is credited as the author of Chōjū-jinbutsu-giga, one of the earliest manga, but this attribution is highly disputed. Sengaku (1203 – c. 1273) – a Tendai scholar and literary critic, who authored an influential commentary on the Man'yōshū, the oldest extant Japanese poetry. Gien (1394–1441) – the 153rd zasu, who later returned to secular life and reigned Japan as Ashikaga Yoshinori, the sixth shōgun of the Ashikaga shogunate. Tenkai (1536–1643) – a Tendai dai-sōjō (大僧正, "archbishop"), who served as an entrusted advisor of Tokugawa Ieyasu, the founder of the Tokugawa shogunate. ^ a b Groner, Paul (2000). Saicho: The Establishment of the Japanese Tendai School. Hawaii University Press. p. 7. ISBN 0824823710. ^ Groner, Paul (2000). Saicho: The Establishment of the Japanese Tendai School. Hawaii University Press. p. 41-47. ISBN 0824823710. ^ Groner, Paul (2000). Saicho: The Establishment of the Japanese Tendai School. Hawaii University Press. p. 31. ISBN 0824823710. ^ a b c d e f g うちのお寺は天台宗 (双葉文庫) [My Temple is Tendai] (in Japanese). 双葉社. ISBN 4575714577. ^ a b "Early Japanese Pure Land Masters, Jodo Shu homepage Homepage". Retrieved 2018-08-25. ^ Abe, Ryuichi (1999). The Weaving of Mantra: Kukai and the Construction of Esoteric Buddhist Discourse. Columbia University Press. p. 45. ISBN 0-231-11286-6. Chappell, David W. (1987). "Is Tendai Buddhism Relevant to the Modern World? ", Japanese Journal of Religious Studies 1987 14/2-3, pp 247–266. Groner, Paul. Saicho: The Establishment of the Japanese Tendai School. University of Hawaii Press 2000. Ziporyn, Brook (2004). "Tiantai School" in Encyclopedia of Buddhism, Robert E. Buswell, Ed., McMillan USA, New York, NY, ISBN 0-02-865910-4.